It's amazing how so much of the drum instructional books and DVDs fail to focus on one of the most crucial aspects of drumming: playing the bass drum. 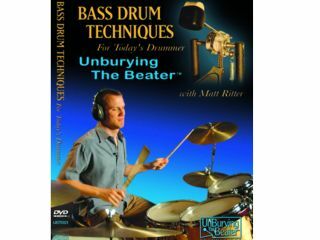 The new DVD entitled Bass Drum Techniques For Today's Drummer, "Unburying The Beater," lays it all out. Matt Ritter is one of New York City's most in-demand drum teachers. His students have included eager children, adult hobbyists, working professional musicians, media celebrities and an international drumming superstar. Having taught thousands of lessons, Matt has developed a teaching style that encompasses music, philosophy, scientific analysis and motivational speaking. In this DVD, Ritter brings his unique perspective to bear on one of the least understood aspects of modern drumset playing: bass drum techniques. You will learn how to harness the principles of physics for a clean and powerful sound, to play lightning-fast double strokes and multiple strokes, how to set up your drums for maximum comfort and efficiency, and how to play faster and more comfortably than you ever thought possible. Having watched this DVD, we can attest to Ritter's approach. Whatever your level, there's valuable tips and insight. To purchase, please visit the official Unburying The Beater website. The retail price is $39.95 US, but you can pick up the DVD for the sale price of $24.95 if you act now.